in an entryway in our home. in an entryway solved a couple of my issues with tracking in dirt. The entry door was very close to the floor when it swings open. 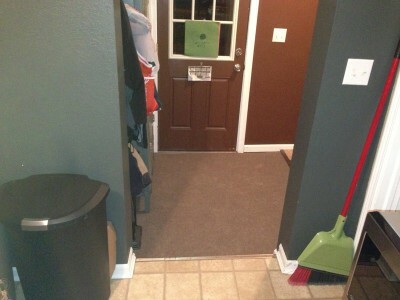 There is no room for an entry carpet to be placed inside the door. 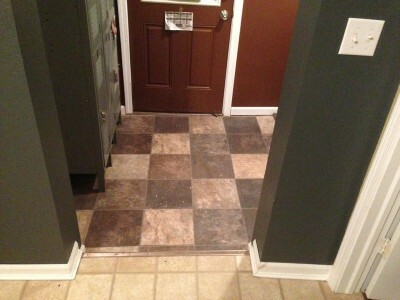 The entryway in question is a 5’6″x5’6″ part of a larger laundry room. The floor had linoleum laid on it. It is, luckily, the type of flooring that sits on the floor, but is not glued or fixed to the substrate in any way. This came in handy when removing the old linoleum. I pulled up the linoleum and cleaned the substrate in preparation for indoor outdoor carpet in my entryway. We went with indoor outdoor carpet because of its versatility. It can get wet and won’t mold. It is also inexpensive and easy to install. Indoor outdoor carpet also often comes in 6′ width as opposed to more standard 12′ widths. This is nice because with a small area to cover, I was able to purchase half the square footage of carpet that would have been purchased with a 12′ roll. For installation, I used indoor outdoor carpet tape around the carpet edges. Right at the doorway there is a metal strip that is nailed to the floor. The carpet went right underneath that strip. The other three edges of the carpet are tucked under the baseboard trim of the room. in an entryway. This is the second time I’ve used it to do an entryway. The first time was with 12″ adhesive squares of Using indoor outdoor carpet in an entryway is a solution to tracked in dirt and debris. It was an easy way to install carpet as well. I recommend using indoor outdoor carpet in an entryway.